When New Zealand driver Michael Pickens took part of the “Gong Show”, he hoped that it would eventually lead to a NASCAR Craftsman Truck Series ride with Roush Racing. Whether or not it does, remains to be seen. 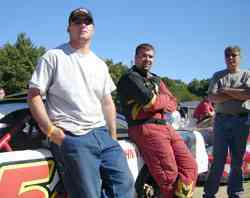 What it definitely did lead to was a ride in the biggest IBG-PASS Pro Stock race of the season, last weekend’s Pullen Heavy Industries 300 at Beech Ridge Motor Speedway. Clark gives almost the same exact account of what led up to the ride, throwing in the fact that the two drivers hit it off instantly. Pickens was a fish out of water at Beech Ridge. He had never been to the track, or New England, before. He had never driven a Pro Stock. 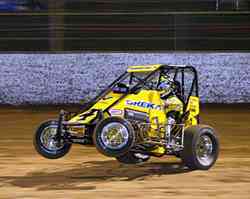 The midget driver was also not used to driving on anything but dirt. One thing that Pickens learned was that qualifying for a big-money open show isn’t always easy. He didn’t make it into the starting field through his heat race or the consi. So the pressure was on Sunday morning when Pickens needed to finish first or second in the last chance race to make it into the big show. He showed that he was up to the task by beating PASS regulars Corey Williams and Cassius Clark to the finish line. Pickens drove in the event as a teammate to Johnny Clark, another participant in the Roush search. 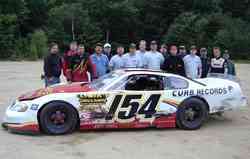 Clark, the 2004 PASS champion, put Pickens into his back-up car renumbered as the #154 for this one race. “I met Johnny at the Gong Show,” said Pickens. “We got talking and hung out a little bit. Basically, we became friends and kept in touch after that. I asked him if there were any opportunities for me to find a car to run and he said that I could run his back-up car if I could cover the costs. Clark didn’t get to see Pickens take the checkered flag though. Nervous about being a car owner, Clark decided to calm himself by working on his own racecar. Pickens didn’t get to show off his abilities too much in the feature though. He had an engine problem and dropped out early, finishing in the 27th position. It’s not clear what Pickens’ next career step will be. He knows where he want to end up and has a few ideas on how to get there. But like many racers, whether they are from New Zealand or Maine, Pickens doesn’t have the deep pockets needed to race as often as he would like. Gong Show, I can get some help to get into a pavement ride to fulfill my dream.